A Force More Powerful is a simulation about nonviolent conflict. 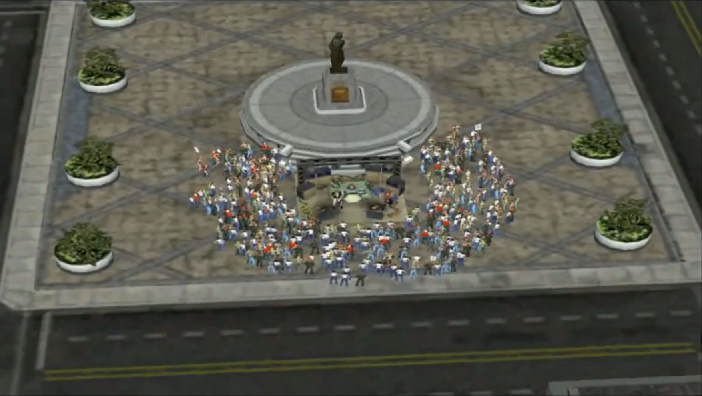 The player attempts to solve 10 different real world scenarios by using nonviolent tactics in an attempt to sway the government or political parties of the local government into affecting positive change. The goal of the game is to win civil liberties for the people, things like earning human rights, removing corrupt regimes/dictators, and earning rights for minorities and women. 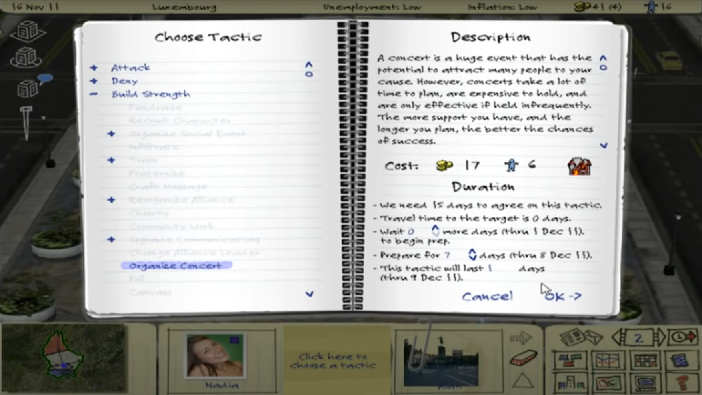 Almost the entire game takes place within a notebook in which the player makes strategies with which to affect change. Each scenario has specific goals that the player must achieve to complete the scenario successfully. The strategies that a player uses can either work successfully, rallying people to your cause or they can backfire which can have adverse effects on the mission. The notebook in the picture is where a player selects the tactic they wish to use. Notice that the options available to the player range from attacking to communicating. The right side of the page shows a detailed description of the action that has been selected. The tactics available depend on the tactician selected which is shown at the bottom of the screen. In this example the tactician is Nadia and one of her tactics is to organize a concert to increase awareness of the issue at hand. Notice that the tactic may cost money and time. This affects the conflict and the actions taken significantly as players cannot take action if they have to little of either. The second image shows a small cut scene of the action that was selected. This shows the people rallying at the concert but also shows that the support is relatively low as the amount of people is fairly sparse. Cut scenes are important in this game as they progress the situation by providing the player with a sense of achievement for all of their planning. But they can also go wrong. Some cut scenes will show the organizers being attacked or worse going wild and starting riots of their own volition. Here the concert is small, but peaceful. Using the right tactic at the right time is important in this game. If the population is already on alert using the wrong tactic can result in riots or military presence. Staging a concert for example while emotions are running high is likely to result in a violent conflict, which the player it attempting to avoid if at all possible. Players have a range of organizers (activists) to choose from. But not all activists are created equal. Some are overly passive and rely on Kum-Ba-Ya tactics resulting in no significant progress. Others are overly aggressive attempting to attack the delivery of supplies to the government in attempt to slow their progression. Choosing the activist that utilizes right amount of force without being violent is critical. Players are restricted to the strategies of their selected activists. This can turn a peaceful organization into a full on riot. Tactics are limited by the cash a resistance organization has, making every decision a critical one. I really appreciate the way that this game takes a Sim-City/Sims approach to broach the topic of oppression and non-violent conflict. The concept is well laid out and the message it sends is very clear. Players can learn how to be active and aggressive with their actions without becoming violent. Seeing the results your decisions produce has a strong lasting impact on the player and reiterates the struggle that real people go through in similar situations around the globe. People Power – This game forces the player into position as the leader of a popular movement. Players use nonviolent strategies as they battle the police, armies, bureaucracy, and the media. It is an evolution of A Force More Powerful and was created using feedback from the prior game. This game raises interesting ideas about developing more games based on real world conflict and adverse situations ideas would be games involving the survival of the holocaust for instance, living through the battle of Normandy, living with prejudice, or just surviving with nothing. Though some games like this exist, I believe making an example of the past so that players can learn for the future is an important concept and should be utilized more often. I don’t believe that obscuring the past and draping it with a cover is conducive to the evolution of people. With the increased attention games are receiving in today’s society it may one day become the medium of choice to teach difficult to grasp concepts to those who would otherwise never be exposed to them.